(Lanka e News – 28.Aug.2018, 11.45PM) It is the general consensus among the Sri Lankans that the country cannot be transformed into a Singapore because of the blunders of politicians, and the economy and society are collapsing because of the rulers. The highest number of government servants are in SL vis vis the population when compared with other countries in the world. That world record was maintained by us over a long period. When comparing the strength of the security forces with the population, SL is in the fourth place in the world. There is also the yellow robed squad who while casting aside their road to Nirvana and their sacred duties take to the streets under the pretext of rescuing the country. Then there are the revolutionaries who have engraved on their chests, motherland is first , motherland is second , motherland is third on behalf of the motherland. 1.4 million government servants , over 400,000 members of the security division , the yellow robed ‘army’ who take to the streets screaming to reform the country , and the revolutionaries who say they are ready to sacrifice their lives for the country put together make up a total of around 3 million of the population. At any rate nothing can be more ludicrous than their so called enthusiasm. This crowd says the country is being devastated by the group of 225 rogues in parliament . The elite force of 3 million is in fear of the group of 225. Any way this disappointing scenario is not the whole story , rather it is only a chapter of a long story . It is true ganja (cannabis) was used as a medicine by Sri Lankans over a long period. After drinking toddy in the morning , and smoking (malak gasa ) ganja in the evening they slowly ‘ate together’ in one house. But after East India trading Co.’ was captured by South Asia , this situation turned topsy turvy. Since the 17 th century it was Rothschide the owner of East India trading Co. who was famous world wide pertaining to cigarettes and strong liquor production. In order to publicize the cigarettes and strong liquor of the British among the people a ban was imposed on local cigarettes and liquor . The British government accordingly named ganja as a prohibited drug.A License scheme was introduced for coconut toddy and kithul toddy with a view to destroy that. In addition , powerful substitutes emerged to replace ganja which went out of use and the poppy flowers bloom of Rothschide Pameer the owner of East India trading Co. was witnessed. Before long heroin was produced through Baur Co . which was under him . Heroin addicts , from Daham Sirisena to the robed monk Kusala Dhamma followed the same route to become heroin addicts.90 % of those who are addicted to heroin in SL initially were ganja smokers. Though ganja is a scourge of society , the manner in which SL’s law enforcing Institutions are viewing it, is regrettable. Because the SL security division is dragging its feet when it relates to ganja , the extent of the dangers besetting this situation has to be made known relying on the Indian security reports .Based on Indian reports ,180,000 to 200,000 kilos of ganja are being smuggled into SL annually. SL police reports reveal only about 25000 to 35 000 kilos of ganja (both local and foreign ganja) were seized. According to statistics , between 600,000 to 700,000 Sri Lankans are smoking ganja , and of them 5 % are women. 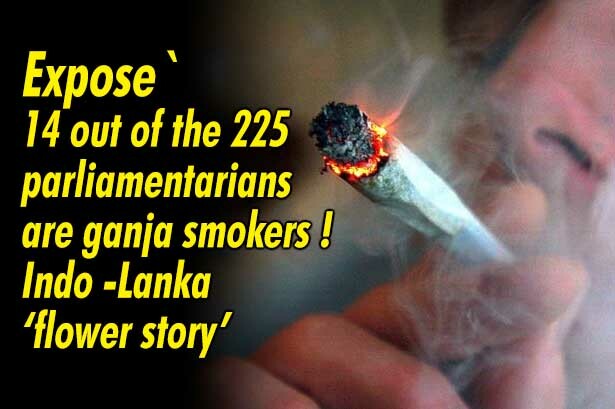 Based on most reliable information , the number of DIGs who smoke ganja in SL are three. Among the forces , there are 11 officers above the grade of brigadiers who smoke ganja . 3 officers above the grade of Commodore in the air force and two officers above the grade of commodore in the Navy smoke ganja. In the security division and the police force approximately 13000 to 14000 also smoke ganja. 14 of the 225 in the parliament are also ganja smokers. Of course this number can be more but not less . The ganja smoking of pilots came to light during the time of the war. Based on the transactions , ganja smoking among the police and the forces have been most raging. The pilots had been smoking ganja massively. After Jayalath Weerakkody became the Air force commander he got ready to curb this ganja menace . Unlike arrack and kasippu , a ganja smoker cannot be identified by the breathalyzer. It can be detected only through blood or urine test. The Air force commander who got down the necessary medical equipments launched a flying squad , and collected samples of blood and urine of pilots. The results confirmed 7 of them smoke ganja. Following this discovery there were whispers everywhere in the Air force that they should be demoted. Some days later the pilots were subjected to a test again. When he scrutinized these results , the commander’s eyes popped out. Lo and behold! 12 pilots were smoking ganja! When further inquiries were made it had come to light ,those individuals who were eager to leave the air force have smoked ganja with greater ardor and given their samples. With that the ‘ganja test’ of the air force commander ended then and there. The ganja business is being conducted with the knowledge and consent of the navy and the police. During the period between 2005 and 2013 , SL was considered as the hub for human trafficking . Large numbers of Indians ,Nepalese and Bangla Deshis who had made payments through intermediaries came to SL through them . Until these illicit immigrants embarked the boats it were the police that provided security from land. It were the navy that took the boat loaded with them to the international territorial sea .High ranking officers of the police and the Navy were shareholders in this human smuggling business. Just for the dispatch of one boat , the police and Navy were paid Rs. 3 to 5 million. When Karannagoda was suppressing the navy’s murders and extortions , it was an officer of the Navy who divulged information to the CID. His name is Lieutenant Commander Krishantha Welegedera .The latter revealed this information not because he sympathized with Raviraj or the innocent children who were brutally and ruthlessly murdered, rather because Krishantha who also played a key role in the human smuggling operation wanted to find a way out from his own implications , and the charges mounted against him . The modus operandi resorted to in the human trafficking was , when 20 large boats are dispatched out , a small boat load is seized and a huge media publicity is given. The ganja business operations were also on the same lines. When 1000 kilos of ganja are smuggled in , they seize 20 kilos of the commodity and make a huge din via the media. The operations at sea of the ganja smuggling are by the Navy while the operations on land are carried out by the Police. As soon as the goods are received by the SL agent , the navy and the police are paid their dues. During the first half of this year alone , the number of members of the security division arrested in connection with ganja smuggling was 24.The most notorious zone where the Indian ganja is unloaded is along Kalpitiya to Mannar. This region is totally a ‘dark zone’. For a long time , this region has been famous for illicit businesses. A region where the mass media and civil organizations don’t even step in. The mass media in SL is a peculiar breed . They belong to the ‘gold fish’ culture . They do not discharge their responsibilities towards the people nor are they investigative to do justice to their professional duties and responsibilities with a view to expose the truth . They are like the goldfish eating what are given and swimming within the enclosure displaying their beautiful fins for the people to watch .These are the ‘goldfishes’ which give huge publicity even to an insignificant quantity of ganja seized by the police .